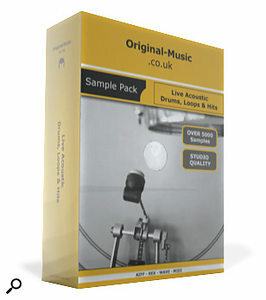 Live Acoustic Drums, Loops & Hits is another bargain‑priced drum sample pack from Original Music. For a mere £9.95 you get 752MB of drum loops in 24‑bit WAV and 16‑bit AIFF formats, REX2 files and single-shot hits. The content covers a variety of different genres including pop, rock and funk, and the pack boasts that the drum parts are played with the Moeller technique, which is famous for allowing drummers to play rudiments very quickly without excessive muscle tension. Although the loops are categorised into folders by tempo or type, the organisation feels very random. For example, the WAV and AIFF folders have significant differences in content, with loops or sub‑folders seemingly left out. In a previous review of Original Music's Dance Drum Samples I criticised the haphazard way in which loops are labelled, and the same is true here. When you start to explore the contents of the pack, you find that some loops have their tempo at the start of the file name, some at the end, and some simply have no tempo data at all. This means that when you open some of the folders, the loops are arranged randomly — and short of renaming them all by hand, they defy organisation! Original Music also name many of the drum loops using letters of the alphabet, and I'd suggest the author adopts a more uniform and descriptive naming system throughout the pack, such as "Tempo‑Name‑Variation”. Organisation aside, the content of the loop pack is good. The drum patterns in the one‑bar 90bpm folder had me reminiscing about classic James Brown breaks like the 'Funky Drummer'. This classic break feel runs through a lot of the rest of the pack. For example, the 'Live Jam' loop is quite similar to the intro of Brown's 'Say It Loud'. There are also some nice variations in the sound of the beats, with some loops sounding open and largely unprocessed, while others have been heavily compressed and EQ'd. On the whole, the processing treatments work, and what they lack in studio sheen they make up for in character. Original Music helpfully include REX2 files of all of the drum loops, and I had no problems importing the loops I tried into Logic 9. These loops make a great add‑on pack for Stylus RMX, and although they're not quite up to the standard of the in-built RMX loops, they have a grittiness and less‑polished quality that layers well with the RMX's slick production.